Published on Monday, September 19, 2011. This article appears in the October/November 2011 issue of American Craft Magazine. Alpinus in Action, 2011; wood, cloth, metal, found objects; 2.7 x 8 x 1.3 ft.
What if a natural historian in the distant future stumbled upon a species that somehow survived from a bygone era - say, the early 21st century? How to read the strange artifacts the animals carried - rusty keys, metal washers, small tools dangling by wire from their bellies or necks? Would the historian guess these were hard-earned talismans, accumulated during the trials of the creature's life? 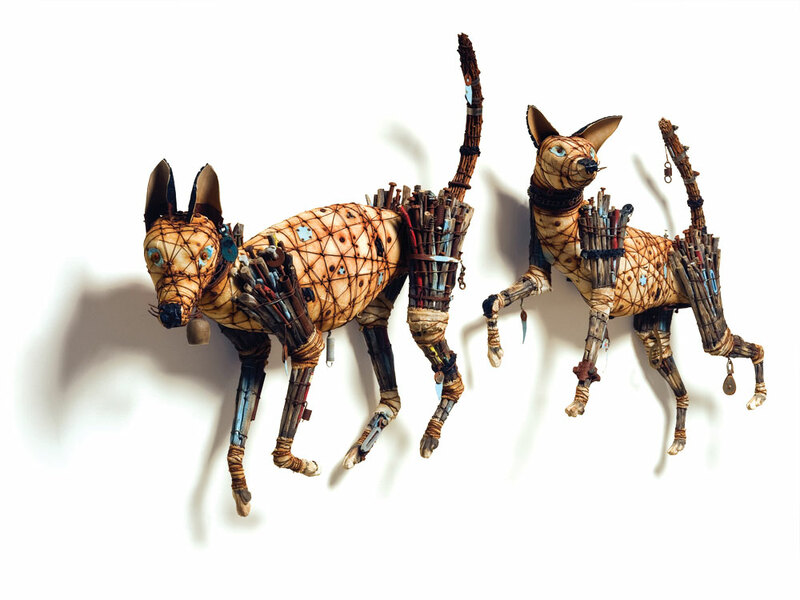 Geoffrey Gorman, creator of such quasi-primordial, artifact-bearing animal figures, intentionally infuses them with mystery. Some of his birds, rabbits, dogs, otters, and other creatures seem sweet, but most emanate an intense, wild otherness, compellingly strange. In the artist's imagination, they inhabit a whole other world - of the past? The future? It's a world we can glimpse but never quite understand. The compact studio in Gorman's Santa Fe home is filled with neatly sorted detritus: rusty metal, canvas, wire, bundles of sticks, mountain bike tires, inner tubes, and other cast-off odds and ends. Yet unlike found-object art in which the identity of the original parts remains clear, these materials are deftly transmogrified - bike-tire rubber carved into an antelope's hoof, or a half-covered penny as an anteater's heavy-lidded eye. Speaking of his creations with a mixture of affection and curiosity, Gorman gives the impression of having made their acquaintance, rather than having made them. "If we were part of his tribe, we would know he went through some rite of passage to acquire this cotter pin from a bicycle," the artist muses conspiratorially, touching an antelope bound for South Korea, a special request from the organizers of the 2011 Cheongju International Craft Biennale. Gorman, 56, grew up in Maryland on a former horse farm, where woods, a quarry pond, and chestnut log barns inspired imagination and making. After studies at the Maryland Institute of Art, Boston Museum School, and Franklin College in Switzerland, he worked as a curator, ceramist, gallery dealer, furniture maker, and art consultant. He began making found-object figures in 2005. Four months after creating the first piece, a Santa Fe gallery offered him his first solo show, which sold out. These days two sources inspire most of Gorman's work: stories he comes across and materials he collects. He remembers being fascinated by a New York Times science article describing 19th-century Dutch naturalists who found a fruit bat specimen in the tropics, took it apart, and sent it to the Netherlands, but neglected to include instructions for putting it back together. 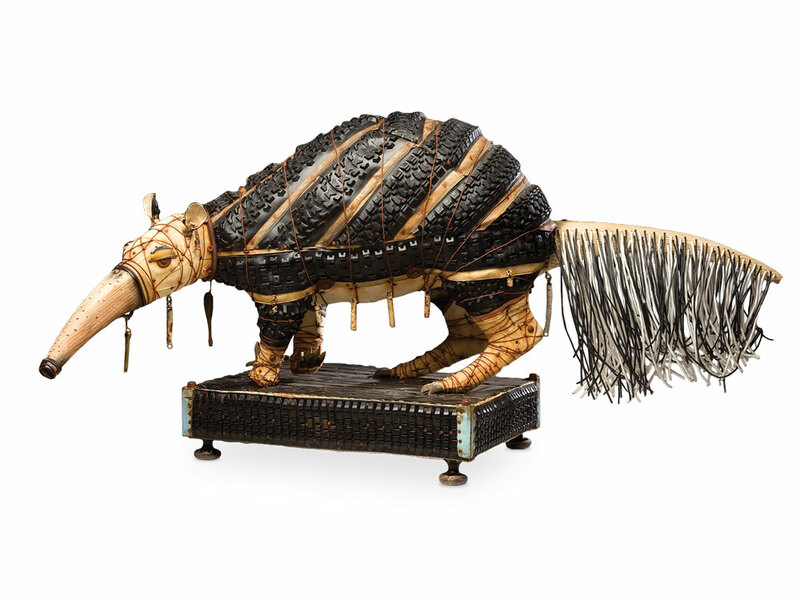 In another case, an appealing anteater emerged after the artist visualized knobby mountain bike tires as its armored skin and old electrical wire as a feathery tail. "The materials I use need to fit certain parameters," he notes. "I wouldn't use barbed wire; it has too many connotations. But rubbery stuff reminds me of whale baleen, of something organic. The materials have to give the sense of something else - skin, hair, teeth, eyes, feet - or feel scientific in a way." Among the aesthetic influences in Gorman's work are African art, Inuit artifacts, natural history displays, and objects beautifully desiccated and burnished by the desert sun. Often starting with a carved wood armature or a core of hard foam, he constructs each beast in a lively, quintessential pose that instantly conveys its mood: relaxed, alert, curious, or poised to run. "I'm lucky in the materials I use," he reflects. "There are really no rules. There's a serendipitous quality about using found objects that you can't control, and that's really fun." Gussie Fauntleroy is a Colorado-based writer who contributes regularly to national and regional publications on art, architecture, and design. She is the author of three books on visual artists. 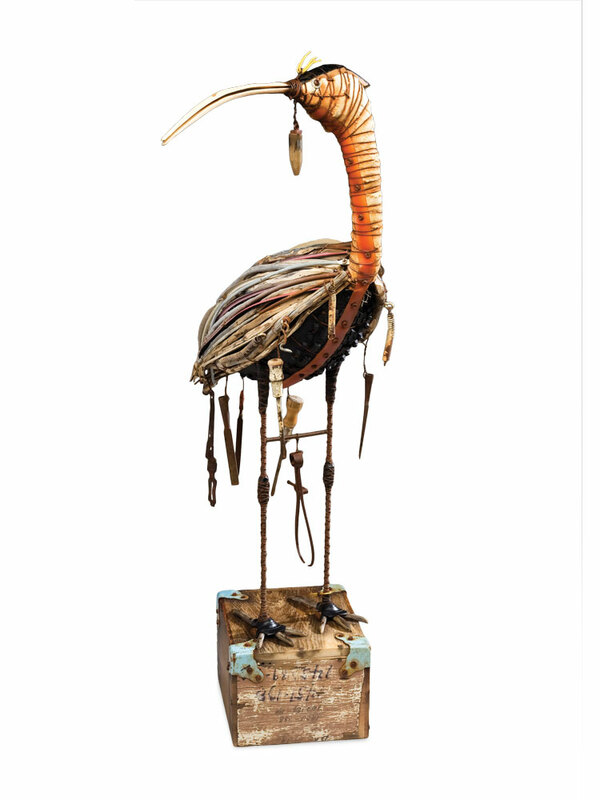 Plegadis Prepares To Plunder, 2011; wood, cloth, metal, found objects; 2.2 x 4.2 x 1.7 ft.
Cinerea Signals, 2011; wood, cloth, metal, found objects; 3.3 x 2.2 x .8 ft.